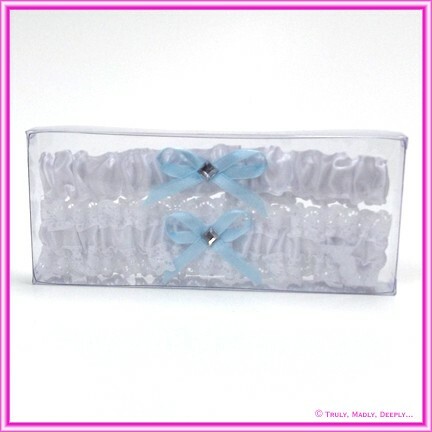 Wedding Garter - White with Blue Ribbon Double Pack (Throw Away) - Made in Australia! Every bride needs something blue. The white garter with blue ribbon is the best way to be wearing something blue, without it standing out against your lovely dress. Both garters feature white satin and blue satin bow. The one you keep, also has a top and bottom layer of white lace and a diamante in the centre of the bow. These garters come presented in a clear gift box.